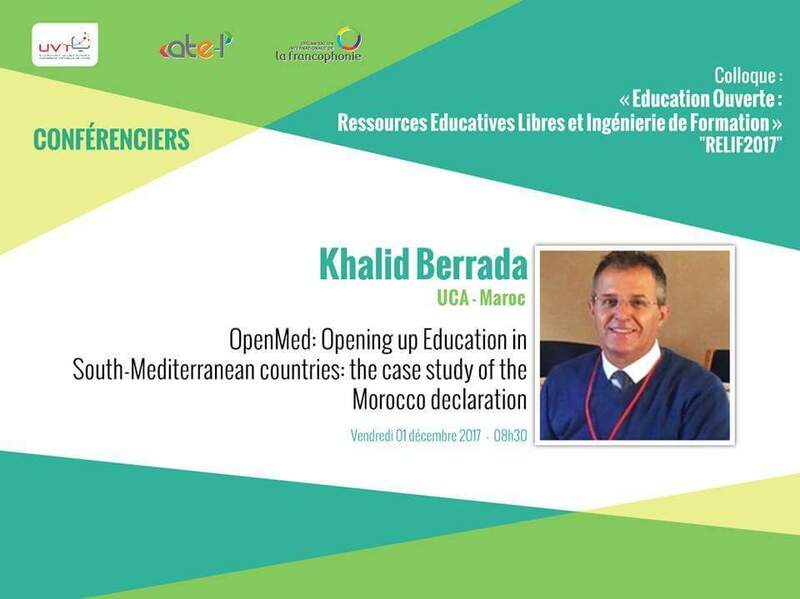 Our OpenMed colleague Khalid Berrada, Director of Centre for Pedagogical Innovation at Cadi Ayyad University, keynoted at the RELIF 2017 Symposium organised by the Virtual University of Tunis in Hammamet, Tunisia on December 1st 2017. The presentation titled “OpenMed: Opening up education in the South-Mediterranean Countries: the case study of the Morocco declaration” focused on the challenges to institutional and organisational models for the creation, management, publication and reuse of OERs, the outcomes to date from the OER Morocco Declaration, and the OpenMed capacity building opportunities for lecturers and other HE professionals. The feedback from the session was excellent, and it’s exciting to see the academics wanting to work more with us in future on developing open education across the South-Mediterranean countries and French-speaking African countries.